The Ford Flathead V8 was the first mass-market V8 and the starting point for uniquely American performance. What’s interesting about it is exactly what made it possible—simple and cheap to build—is exactly what doomed it as well. The Flathead is interesting to me because of how it was designed. It was at the height of Henry Ford’s “Boss from Hell” phase of his career, and he had multiple teams working on designing this engine, in secret, in competition with each other, and he often saddled them with strict design requirements that ranged from damaging to impossible. An excellent history of the whole process is up on Ate Up With Motor but I’ll highlight two sections. The first notes how Ford unintentionally sabotaged the engine with his manic requirements. Don’t forget that Ford was a self-trained engineer, a farmer’s son, and it was his innate knack for machines and his built-in stubbornness that got him as far as he did, though failed companies and irate investors. 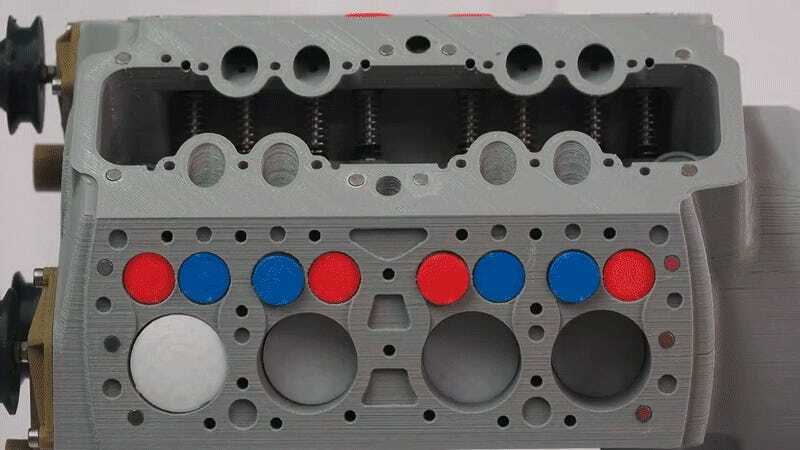 So the engine was compromised to meet mad old Ford’s design ideals, but it was still an amazingly simple engine, particularly with that flathead layout of valves next to the cylinder with a flat cylinder head not carrying any valves above them both. But it’s exactly that layout that ultimately doomed it. Engineering Explained notes that while a flathead is indeed simple and easy to make, the way Ford had it meant that it was inherently bad at breathing, bad at cycling air and fuel into the cylinder and then exhausting it out. Air rushing into the cylinder past the intake valve had to go up, then over then down to actually get into the cylinder itself. Then it had to double back as exhaust bumping back into fresh intake air coming in. Modern engines keep a single flow from intake on one side to exhaust on the other. Not so in this flathead. What’s more, any attempt to make the engine breathe better with more room in the head comes at the expense of engine compression. The more room you hollow out for air to go in and out of the cylinder lowers your compression ratio, something that Engineering Explained notes in his video, and something that we went over a bit in our big compression ratio article. This all helps explain why these early V8s started out with about an amazingly low 5.5:1 compression ratio. The flathead, in effect, was like a Greek hero with a tragic flaw. Exactly what made it possible is exactly what made it bad. Ford might have been able to make it better, and the engine did improve over the years, but Henry’s design constraints meant that the engine could never really be made more modern. And once overhead valve engines, particularly from GM, started becoming available after the war, the flathead virtually disappeared.